Why the 2014 Honda CR-Z? The exterior styling is great, I get lots of positive comments. The interior styling is good overal but some details could be improved. I liked almost all the color choices, the Milano red was my favorite. The powertrain is very well designed. The integrated motor assist adds a lot of low end torque and the engine revs freely with almost no vibration. The manual transmission shifts smoothly and the 6 speeds are spaced well. I have averaged about 40 MPG for the 3500 miles I have driven. I feel this is very good since most of my driving has lots of hills, stops, turns, and the speed limit on our interstate highways is 70 MPH. 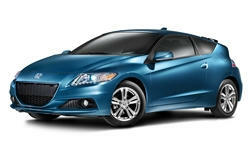 Why Not the 2014 Honda CR-Z? The ride is not punishing but could be smoother. The noise is not unusual for this price range but could be quieter. The front seats are very comfortable and supportive. There is a lot of adjustment available for seat and steering wheel positions. I had no trouble finding a good driving position with good front visibility. There are lots of storage compartments. One compartment is cooled by the A/C. The cargo capacity is adequate for most needs. The controls and instruments are very futuristic in style but work well and give a lot of information.